We encourage you to create a design and Moorcroft will do the rest. A unique work of art is an attractive proposition and a piece of Moorcroft in your home carrying your own design or one from a family member or friend is hard to resist. It comes at a price of course, but, on a very recent BBC Antiques Roadshow, a vase designed by an art undergraduate reappeared among all of the antiques to receive an expert’s valuation of £1500! So what must you do to start the process which will ultimately lead to your design becoming a one-off of ceramic artwork? Like all good ideas, it is simple. Our unique tubelining skills must be borne in mind when creating any design you submit. Your design must have clear linework for tubeliners to follow and we will do our best to find the colours which are the nearest compatible match in our range of metallic oxide colours. 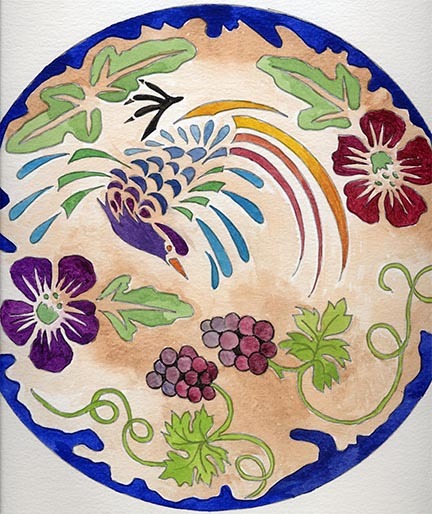 Any designs that have no lines, but which rely on glaze effects, cannot, we regret, be made. For total understanding, your design can be submitted as a watercolour (preferably) although we may be able to work with coloured pencils. 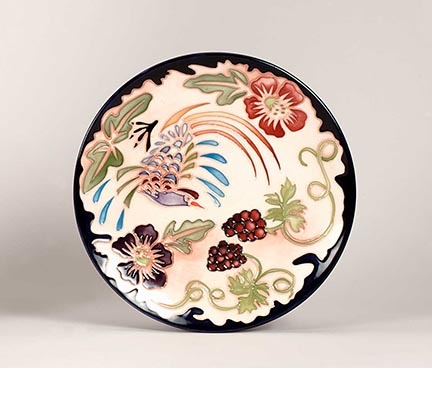 The piece will carry all of the usual Moorcroft marks including our trademark name. In addition, it will show the date of manufacture and your name or initials. In short, every Time for Design piece will be totally and utterly unique. We strongly advise that you use templates supplied by Moorcroft which can be posted or emailed to you upon request. 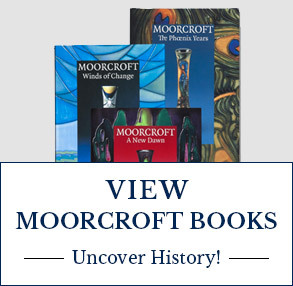 We have some special Terms and Conditions, and these points must be fully understood at the time they have been received back at Moorcroft, signed and dated. 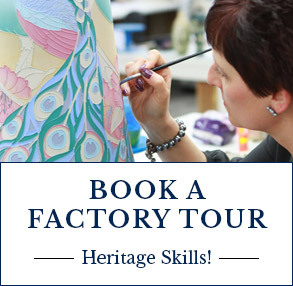 To discuss creating your own design, receive shape templates and our Terms and Conditions, please Email: enquiries@moorcroft.com who will be able to provide you with more information. Moorcroft has phenomenal expertise in creating a wide variety of bespoke Corporate Gifts, Awards and Trophies for many different purposes or occasions. Whilst some of our clients are from government bodies, sporting entities, famous individuals and businesses, others are from well-known Museums, Charities and Societies such as the Royal Society for the Protection of Birds, Royal Horticultural Society, National Autistic Society, NSPCC, the National Trust for Scotland, The Born Free Foundation, Douglas Macmillan Hospice, The Low Pay Unit, Piggybankkids, Watts Gallery, Dorset Wildlife Trust, Somerset Wildlife Trust, All Creatures Great & Small Cat Sanctuary and The Lord Mayor of the City of London. Moorcroft has also made gifts to HRH The Queen and other members of the Royal Family over the last century. 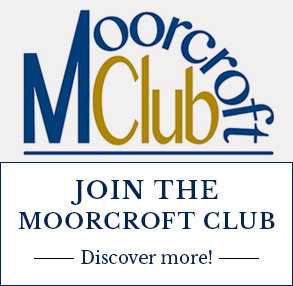 Please contact Marketing Director, Catherine Gage, on Tel: 01782 820500, email: catherine.gage@moorcroft.com should you wish to discuss a bespoke creation for your business, charity or other entity/person. Charges vary for individuals and businesses depending on specifications. Charitable Commissions are considered on an individual basis.